THE CHRISTMAS Craft Fair got off to a cracking start this weekend with 700 visitors within the first hour of opening at 7pm on Friday. 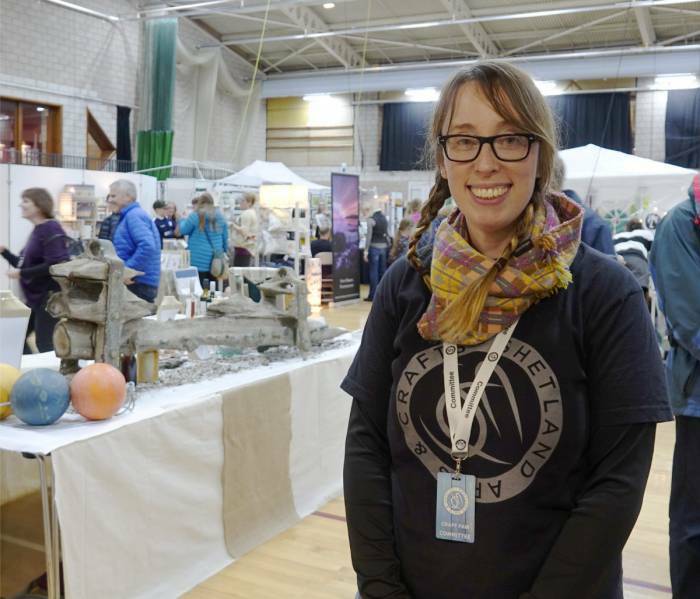 According to Shetland Arts and Crafts Association treasurer Emma Geddes there were the same number of stalls as last year, but with more large ones and a very pleasing response from the public. The growing professionalism and sophistication of the displays and crafts works was evident and according to Emma, arts and crafts in Shetland are going from strength to strength. She said: “People have been producing loads [for the show] and there is just a bit more variety than last year. Kate Holt, Brandon Williamson and Jocelyn Holt on the Greencroft stand. The fair is running in the main hall and bowls hall of the Clickimin Leisure Complex till 5pm on Sunday and good crowds are expected each day. One of the most striking displays is Greencroft Shetland with its mini whitewashed croft houses that can be used as garden planters or purely for decoration. To that end they can be bought roofed or unroofed, or you can grow your own felly roof. Jocelyn Holt of the Quarff based business said each croft house is made from recycled glass, Shetland stone and cement and hand painted. 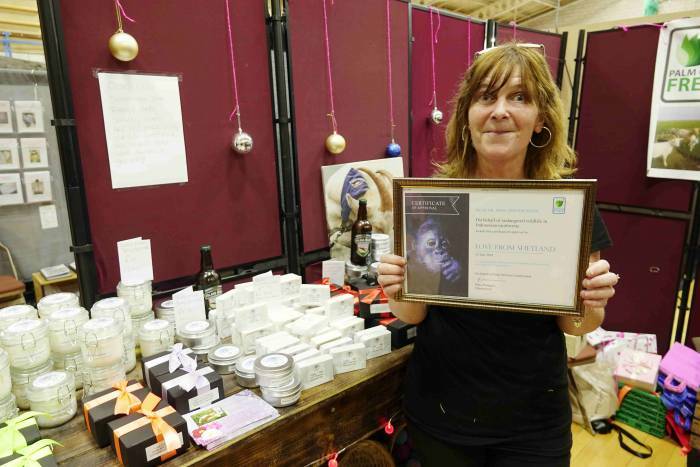 Esther Jeromson with the palm oil free certificate. Love From Shetland have introduced several new products and have just received palm oil free certification – the first business in Scotland to be so accredited, said Esther Jeromson. Palm oil free products are intended to help to protect the wildlife of Indonesia from deforestation through the creation of large plantations. The Gruting based business has added Valhalla Brewery beer infused soap to its line of goats milk based shampoo and shaving soap products and will be adding Lerwick Brewery beer to forthcoming products. Leanne Hutchison with some of the Trowie Knowe crafts. “We have also sold a lot of body butter made with goats milk,” said Esther. Love From Shetland soap is alo available as an alternative on NorthLink’s ferries – but you have to ask for it at the steward’s counter. 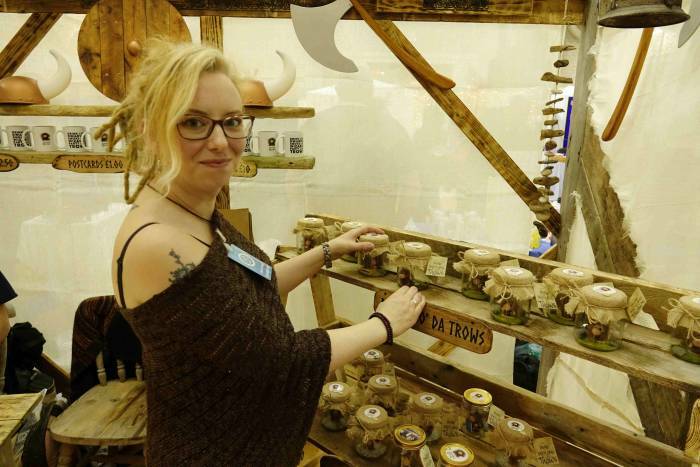 Trowie Knowe Crafts is another very striking stall – a thematic crossover between Viking and a very bright trowie hadd. The company, owned by Leanne Hutchison and Neil Pottinger specialises in quirky trow styled gifts and is hoping to streamline production and provide a shopfront when a lambie shed is converted into a workshop is completed at Bridge End in Burra. At the moment the trows can be bought online or through a number of Lerwick businesses such as N-graved, Clock Tower Cards or A1 flooring and MacKenzie’s Farm Shop in Cunningsburgh. Brae pupils Freya Balfour and Bethany Laurenson on the Replenish stand. 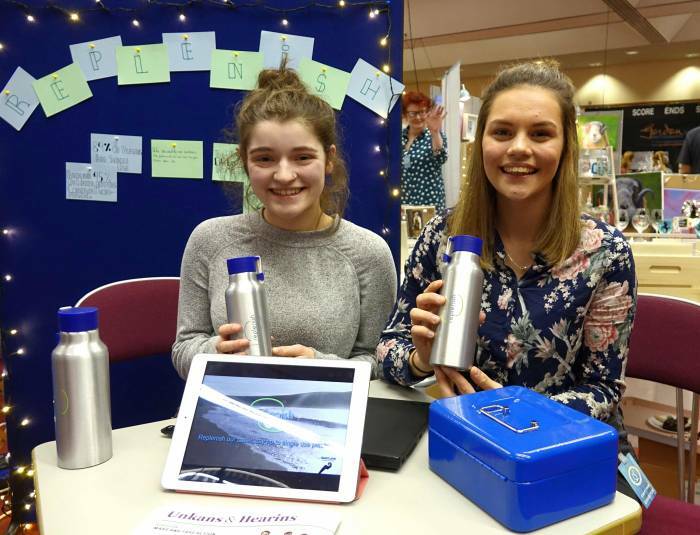 Brae High School pupils with an environmental message were in the bowls hall selling metal flasks under their Replenish banner – an initiative spurred by the single-use plastics problem. The lightweight 500ml bottles are ideal for taking on walks, to the peat hill or even out on Up Helly Aa. 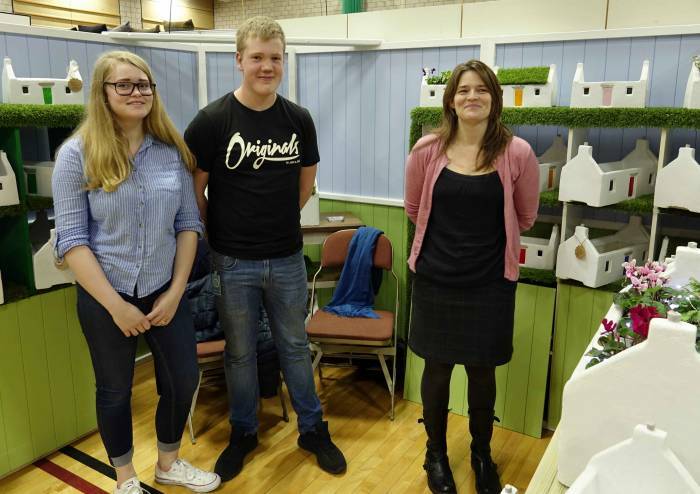 The project was started in September and will be entered to the Shetland Young Enterprise competition in March.